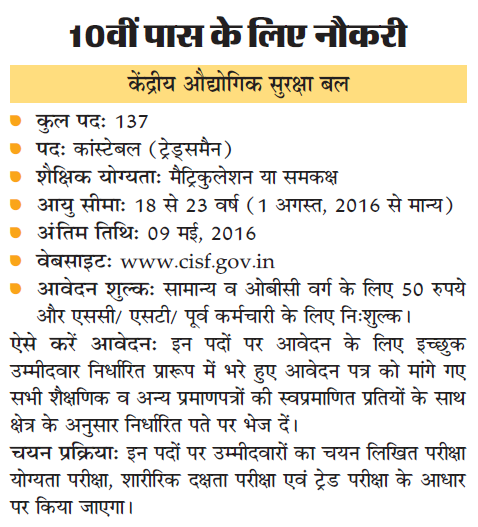 The recruitment will be conducted on All India basis.Temporary Posts. Candidate should submit their application only as mentioned against their State of domicile. These vacancies may increase or decrease without any notice. Reservation for Schedule Caste/Schedule Tribe/Other Backward Class (OBC) categories will remain as per Government Orders and as communicated by Ministry of Home Affairs. Area of job-Selected candidates are liable to be posted anywhere in the country. It is noted that Ex-Servicemen candidates are eligible for Total relaxation in physical standards. Eligibility test + Physical Efficiency Test + Written Test and Trade Test. + Medical Examination. Application Fee : 50/- (Rupees fifty only) through Postal Order.No fee for SC/ST and Ex-Servicemen candidates. Apply on prescribed format.Format available on website.